with Biokleen's Premium Plus Laundry Powder. Safely whitens and brightens with natural Oxygen Bleach, Grapefruit Seed and Orange Peel Extract, natural water conditioners, and natural protein digesters. A powerful laundry cleaner and deodorizer without added, harmful ingredients. Gentle and safe enough for your most delicate washables, including cloth diapers; leaves no irritating residue or odors behind. Our everyday cleaning choices affect our health, the health of our family, and the health of our planet. Biokleen household products are a natural, non-toxic and effective choice for you and the environment. 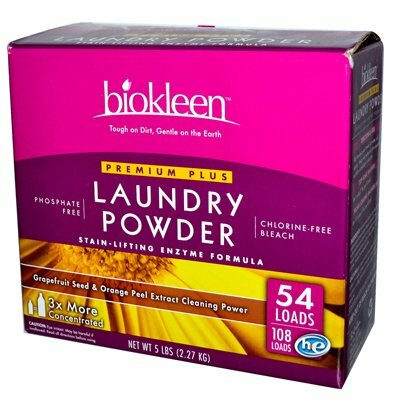 Biokleen Premium Laundry Powder with Enzymatic Stain Lifters and Oxygen Bleach doubles the cleaning power to remove the toughest stains and odors. Cleans, brightens whites and colors, and deodorizes without using harsh chemicals. Rinses clean, leaving clothes free of residue and harsh fumes.